We’re looking for a tour guide to join our team. You’ll wear a costume and show visitors around the exciting area of Akihabara. On our tour we don’t simply point out the sights; our guides use their communication skills to give visitors their own impressions of Japan. 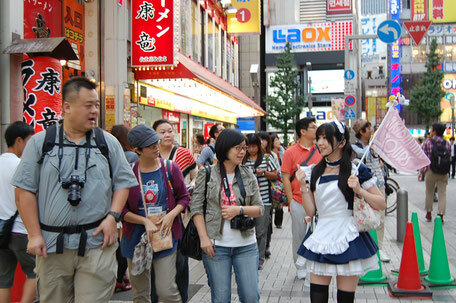 Our aim is to give visitors the ultimate welcoming experience that only AKIBALAND TOURS can provide. In addition to the standard tour guide skills, our guides are expected to develop their skills through our specialized training program. Are you keen to tell people how awesome Japan is? 1 As a rule, applicants should be under 28 years of age. However, depending on the individual, applicants can be older. 2 We are hiring both male and female tour guides at this time. 6 Applicants should have an interest in cosplay. * Please note that formal language qualifications such as TOEFL, TOEIC, the Japanese Language Proficiency Test, etc. will not affect your application. Akihabara; other areas of Central Tokyo; other areas of Japan (depending on tour content). Irregular; guides will be needed on those days on which tour reservations have been made. Between 10am and 9pm, with one tour lasting approximately 3 hours. Number of tours in one day will vary depending on number of reservations. Starting hourly wage: 1,500 JPY (raises will be given based on language, experience, and ability). Transportation expenses will be paid. Please take a video on a mobile phone introducing yourself and saying why you want to work for AKIBALAND TOURS (please keep videos to less than one minute in length). Please send all requested documents, photos and video to info@akiba-tour.com, with the subject header "Tour Guide Application". Please send any questions about the process to the above email address. We cannot take enquiries by phone. Thank you for your interest! Please check out our website and Facebook pages for more information about us.